Authorities say said 36-year-old Charles Samuel Baines abducted his sons, 10-year-old Charles Samuel Baines Jr. and 9-year-old Nathaniel James Baines, from a Harbor City home on Wednesday, Nov. 27, 2013. 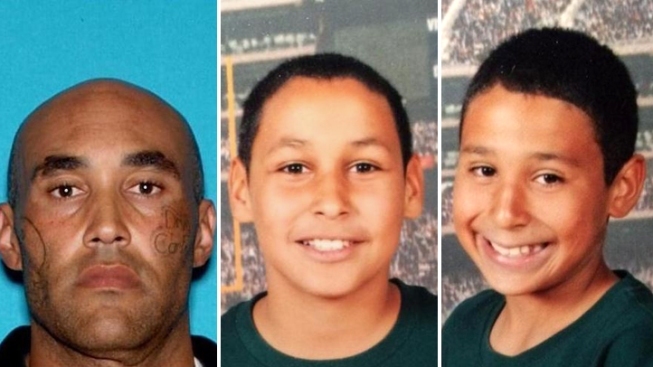 The public's help is sought to track down two boys who were abducted by their father - a parolee who has mental health issues - from a Harbor City home Wednesday, authorities said. Los Angeles County sheriff's investigators said 36-year-old Charles Samuel Baines took the children from his mother's home in the 24800 block of Normandie Avenue, just south of Carson. Baines' mother, who has custody of the boys, was sleeping at the time. Investigators fear that Baines and the boys, 10-year-old Charles Samuel Baines Jr. and 9-year-old Nathaniel James Baines, may now be in Mexico. Investigators said the trio may be riding in a red, four-door 2008 Kia Spectra that the man stole from one of the boys' custodial grandparents. The car has a license plate No. 6FMN288. Baines, a Harbor City resident, is described as an African-American man, about 6 feet 4 inches tall, weighing 270 pounds, with a shaved head and brown eyes. Investigators said he has a facial tattoo with the words "Drug Cartel" on his left cheek. Anyone with information was asked to contact the Los Angeles County Sheriff's Department Carson Station at (310) 830-1123.